Brighton & Hove Albion striker Glenn Murray says the Seagulls' Premier League destiny is still in their own hands. Albion's winless league run increased to six games when they lost 3-1 at home to Burnley on Saturday. Brighton are now just three points above the relegation zone but Murray said: "It's still in our own hands, our destiny. "We're in it and there's no point in denying it or worrying about it. "It's about being together and keep doing what we're doing and I'm sure the gaffer won't change as he never has in my time here, whether it's close to relegation or close to promotion. "He's very level headed and I'm sure that will remain to be the case." 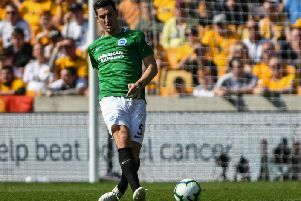 Murray reflected on a key incident after the game when Albion had penalty appeals waved away seconds before Burnley got a spot-kick of their own to go 3-0 ahead. He said: "It's not good enough losing 3-1 at home but I thought we came up against another inspired goalkeeper in the first half. "He kept them in the game and from that point they probably went from strength to strength. "In the second half it's a huge decision by the referee and linesman. They can be season-defining moments. "If you get the opportunity to get back into the game and change the momentum like we learned at Fulham, the whole momentum of the game changed and they had the impetus and went on and won the game. "You never know. From not giving a penalty to going up the other end and giving one, it was rubbing salt into the wounds."